If there's one public relations tool that authors (and just about everyone else for that matter) gets wrong, it's the press release. I see ignorant bloggers claiming "the press release is dead" all the time. They're usually the ones who have used them wrong for years. In some circles they've become synonymous with "spam." But thankfully the press release isn't dead. And if you learn how to use them correctly, and are willing to put the work in, they can still be effective tools in your author PR arsenal. 1. Tie your book to something timely. It needs to be newsworthy. And no, launching a book, on its own, is not newsworthy. Not unless you're already a household name. Otherwise, nobody cares that you wrote a book. Your press release is one tool you can use to convince them to care. Does your book touch on a topic in the news lately? Mention that in your press release. Is it seasonally tied to something current (holidays, seasonal activities currently trending, etc.)? Again, use that in your press release. Why should anyone care? And why should they care right now? 2. Lose the direct promotion. The press release is a PR tool. It's not a "promotional" tool. They are not the same thing. So leave direct, self-centered promotion out of your press release. It should never read like an advertorial. Your job with a press release is to benefit the readers / viewers / listeners of whatever media outlets pick up your story. Never use words like "best," "great," "awesome," or anything else that equates to you tooting your own horn. You'll look like a jackass. And most members of the media will promptly dismiss you and your pseudo-news. Worse, you risk being placed on their blacklists, meaning they won't look at (or even receive) future releases from you after you've gotten your act together. 3. Let the media know where they can learn more. I can't even count the number of times I've seen launch press releases where people forgot to tell members of the media where they could learn more about a book, website, or other product. What the heck is the point of distributing a release if you're going to leave readers hanging? Tell them where they can get a high resolution copy of your cover art or an author photo. Point them to your media kit or online newsroom. Link them to your author website, not just your Amazon sales page. Tell them how they can get a review copy (again, such as going through your online newsroom). And include appropriate social media profiles if your distribution service allows it. And don't fudge the contact information. I've seen authors use fake names and phone numbers in the past. But that's a stupid thing to do. The whole point is that you want to be contacted. You don't just want reprints of your press release. You want reviews, interviews, and profiles. And you'll get none of those things if members of the media can't contact you (or if they do contact you and find out you lied about anything). 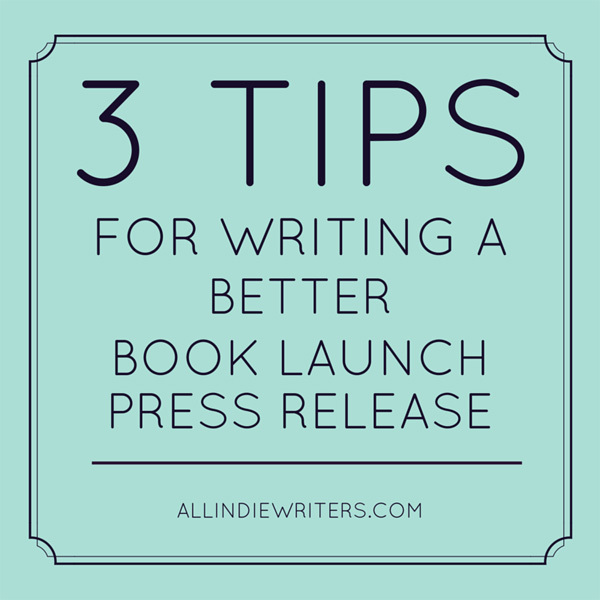 These tips only cover the writing of your book launch press releases. Later this week we'll delve into the distribution side of the equation -- something else frequently misunderstood and messed up. I’ve been trying to get info on when my press release should be sent out. I am about 2 months away from my book release and not sure if I should get it out now or once the book is already out. This will be my first book and not sure how the industry handles that. Timing depends on a lot of things. For example, if there’s some timely event or news happening related to your upcoming book, you’ll want to take advantage of that. It also depends on what your goal for the release is. If you’re hoping people will promote it once it’s out, wait until launch day. If the aim of your release is to try to land interviews and such, you can send it out pre-launch (as long as you’re prepared to send pre-release copies to media outlets). It also depends on how media-friendly your book is — a novel, for example, can wait until launch day in most cases, whereas nonfiction books can have a lot of pre-release potential for media coverage. Three simple tips that stand out.